The International 2017 is this year in it's seventh edition. Organised by Valve, this Dota 2 Tournament is the biggest and most prestigious of the season. Not much is known at this point, but chances are it is going to be held in similar fashion to the previous years. Valve is likely going to put up an amount of money as the base price pool, to which the community can contribute by buying the compendium to the International. This approach has proved itself successful in the past, for example 2016 the base price pool of $1,600,000 got raised to an astonishing $20,770,460 by the Dota 2 players. Based on previous Internationals, no region (east or west) could field a winner two times in a row. It is going to be very interesting this year, seeing as Wings Gaming (China) won in 2016, to see if the winner comes from the western hemisphere. Unfortunately Wings Gaming won't be attending this year, as the team no longer exists. The venue where it will be hosted is the KeyArena yet again in Seattle, USA as location for The International 2017. The International 2017 is going to be very exciting for a number of reasons. One is the new Dota 2 Patch 7.0, which overhauls the map, the heroes, many items and also brings other sweeping changes. The first big trial to see which team can adapt the best will be the Kiev Major 2017 at the end of April. LGD Forever Y. 2 LGD Forever Y. The TI7 groupstage is up first this year. This time around Valve decided to have two groups instead of the one group played in the Swiss system. We'll see how this changes up the tournament. Additionally they are going to make sure that the two groups have an equal mix of teams, so they are as fair as possible. Of course this is a hard decision to make, as the teams have layed low in recent times and kept their strategies and form hidden. You can find all the results and schedule on our site for the TI7 schedule. Valve keeps their system relatively the same compared to the Kiev Major and invites only a few teams directly to TI7. The winner of last year, Wings Gaming, is unlikely to participate in the tournament as the team has basically folded and their members have joined new teams. On the other hand, Valve has invited OG, one of the most successful Dota 2 teams and winners of the Kiev Major, directly to The International 2017. Further invites are Virtus.pro, Evil Geniuses, Team Liquid, Invictus Gaming and Newbee. All the other teams have to go through the qualifiers. There are two layers of qualifiers for TI7. First, the open qualifiers where every team can sign up to participate in. They will be held from 22. June to 25. June and the best teams will advance to the regional qualifiers where they have to face up against teams directly invited to the regional qualifiers. The regional Qualifiers will run from 26. June to 29. June. This brings the total teams to 18. They will be split in 2 round robin groups, similar to what happened at the Kiev Majors, and the two worst teams have to pack their bags before the tournament really started. The remaining 16 teams will move on to the double elimination main event at the KeyArena. All the following teams have qualified for The International 2017 in August. At the beginning all the teams are divided into two groups in a round robin format. This means that all teams within a group play each other. After that is done, the top 4 of each group advance directly to the upper bracket of the main event, while the rest goes into the lower bracket. The last place in each group gets already eliminated in this stage. All games in the group stage are played in a best-of-two.There will be 16 teams at the main event, which is played in double-elimination. This means that one loss is not the end of the tournament life of a team. The playoffs will take 6 days and will end in the grand finale. For the complete TI7 schedule click here. Naturally you can also bet on the groupstages of TI7, it is the biggest tournament of the year after all. Many, many games are played simultaneously and with only short breaks inbetween, so the screenshot below only represents a part of the available betting odds for the TI7 groupstage. Every matchup is being played in a Best-of-Two, this gives rise to the possibility of a scoreline of 1:1 resulting in a tie between the teams. Furthermore, there are obvious favorites in some matchups, their odds are the result of the team's recent form. But everything can happen at The International 2017 and no winner is set in stone yet. There are even live bets for the TI7 group stages, which offer an interesting and exciting alternative to traditional betting. 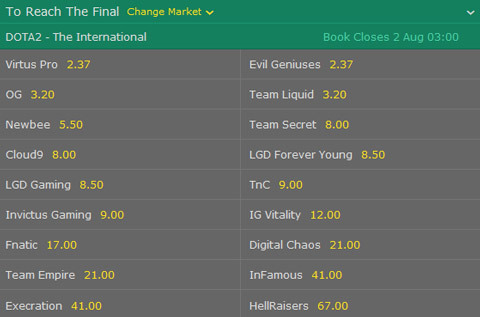 The first odds for The International 2017 outright winner bets are here! Bet365 and Pinnacle have already released their odds for the bet on the outright winner of TI7. Please note that the tournament start is still some time away and the odds are subject to change. 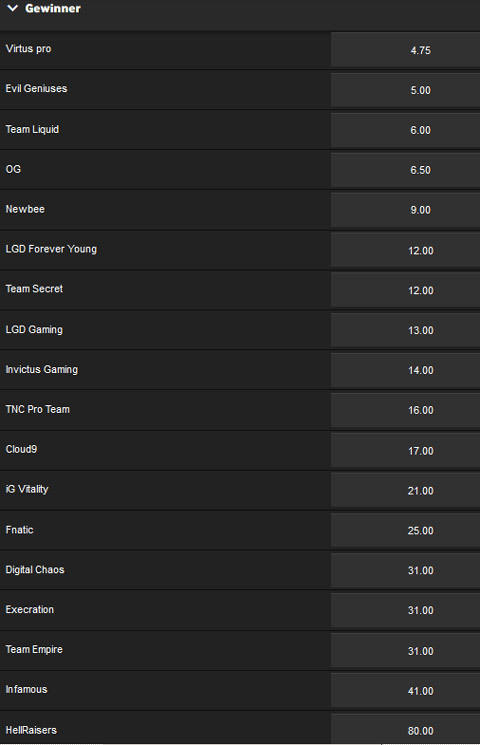 Checking the sites of the esport betting providers is thus a good idea. Bet365 has released a lot of TI7 compendium special bets and tournament special bets. These are very interesting new bets and odds which focus on the games as a whole and not on individual winners. 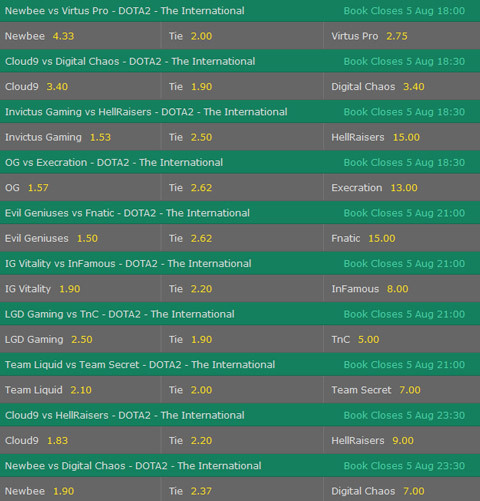 For a better overview of the different TI 7 bets and odds click here. Find out more information on how betting in Dota 2 works here. How much is up for grabs is still unknown at this point, due to Valves unique approach to financing such events. They will put up a specific amount of money and the community can contribute, by buying an in-game item, to it. In the past years this approach worked wonderfully, for example Valve put up $1,600,000 for the International 2016 and the community raised it to an astonishing $20,770,460. The question if the pricepool is going to be even higher, is going to be an interesting one. Final result: The Prizepool for The International 2017 in Dota 2 has reached $24,787,916! In addition it is now the biggest prize pool of any eSports tournament ever and the winning team will receive over 10 million dollars! More information about the TI7 prizepool here. All the teams without an direct invite, but who still want to participate, have to go through two sets of qualifiers. First up are the open qualifier, where every team can register themselves. The winner are going to the regional qualifier to play for a spot in the International. The Battle Pass for this year's The International 2017 is out. It comes in two different variants, one with level 0 for $9,99 and one with level 75, including a variety of cosmetic items, for $36,99. For every level you earn in the Battle Pass you'll receive different rewards, such as items and effects in-game. In addition you can straight up buy levels from the Dota 2 store. 25% of the revenue goes directly to the price pool of The International 2017, it will be exciting until the end to see how high the price pool will rise. Included with the Battle Pass is for the first time a co-op multiplayer campaign in two acts, where you can play with your friends and earn different rewards. Also included are already known features like the player book, where you can collect player cards and predict how The International 2017 will go. If predictions are correct, there are rewards waiting to be collected. The quest system from last year is returning as well. More Information about the Battle Pass here. Like every year, the International is going to be streamed free of charge over the internet. If previous years are any indication, English and other languages will be available. A variety of commentators and analysts contribute to the experience and excitement. As there are four games being played simultaneosly in the group stages, there are of course 4 streams.